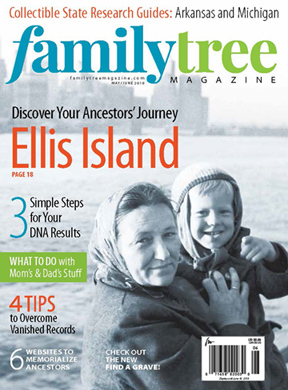 Get a FREE ISSUE of Family Tree Magazine! Celebrate the New Look at Family Tree Magazine – Get Your FREE ISSUE Today! Family Tree Magazine – America’s #1 family history magazine, is the leading how-to publication for those who want to discover, preserve and celebrate their roots – is celebrating its new look with a very special offer! 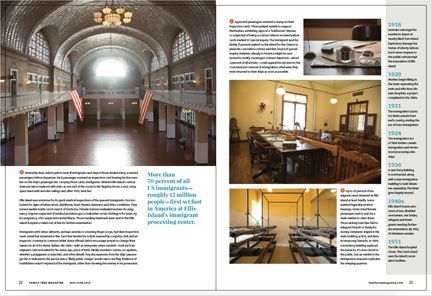 Get the new May/June 2018 issue – with articles on Ellis Island, free collectible research guides on Arkansas and Michigan, and more – for FREE! Click HERE to get this amazing offer from Family Tree Magazine. Just provide your name and email address, and you’ll be able to download the PDF version. “There’s more to our makeover than a streamlined cover and bolder logo. We wanted to provide inspiration in addition to instruction. We wanted to show you how other people have discovered their ancestors, and how family history is relevant today. Click HERE to read more about the new look at the Family Tree Magazine blog. Once you take a look at the free May/June 2018 issue, you’ll want to subscribe to Family Tree Magazine so you don’t miss another issue! There are some great deals starting at just $19.96 per year for the digital version – click HERE for more information!